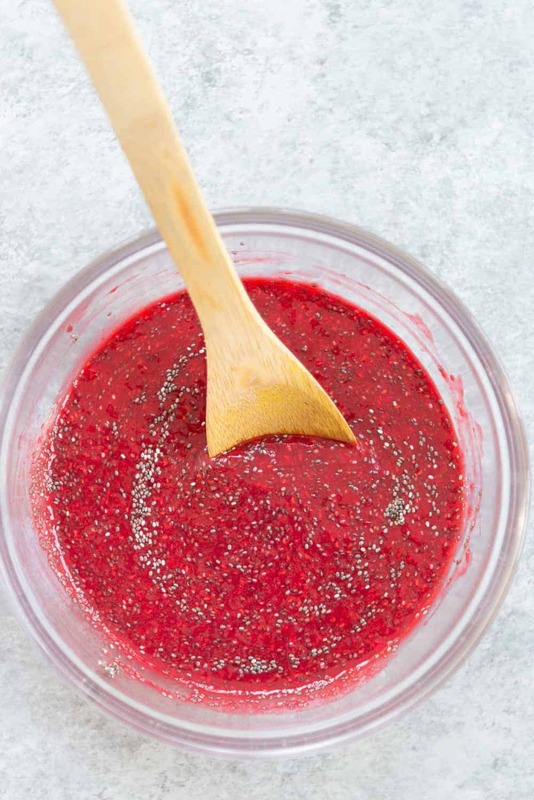 Frozen berry chia jam! Are you sitting down for this one? 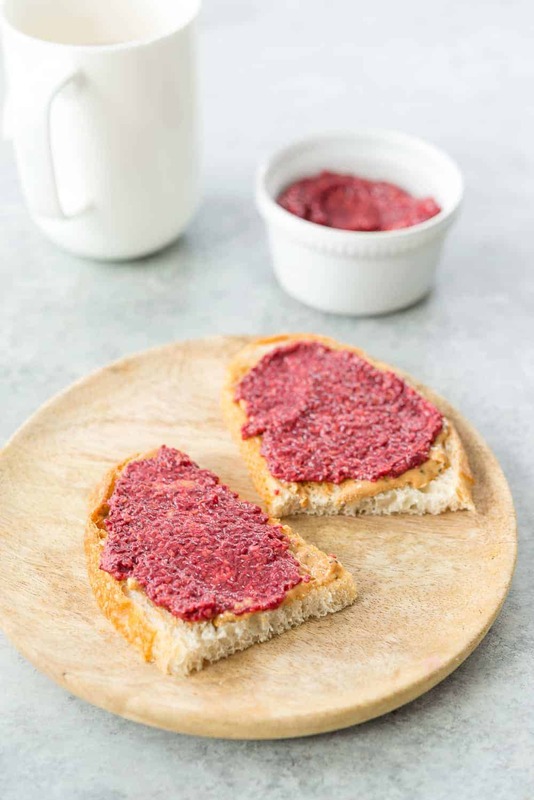 If you like raspberry jam (yes!) but want to have a lower-sugar option (of course) and also want it to taste delicious (duh!) then this is the recipe for you. I’ve now introduced TWO money-saving, life-changing DIY recipes this week. That’s right friends– my homemade oat milk recipe for those of you like me who love oat milk in their morning bowl of cereal but do not want to spend $5 on a carton. And, for those of you like me who also love the idea of making jam without sugar but don’t have the time (or patience) to whip up homemade jam on the regular. I present to you: frozen berry chia jam. I’m a mom now! 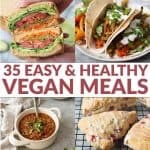 Quick, easy food is all I know. I did not alter the color! That’s really how it looks. Amazing, right? I recommend using frozen berries because they are typically much cheaper than fresh berries and as the texture doesn’t matter, it’s likely not worth the extra expense. I’ve been making a batch of this almost weekly to spread onto toast and freezer waffles. Sometimes I’ll make it extra thick and give it to Vander like a pudding! Or, stir it into oatmeal or yogurt for him as a snack– he loves it and I love giving it to him. 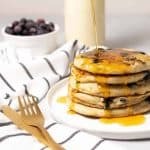 Chia seeds are a nutritional powerhouse, with 10g fiber and 5g protein per ounce. Thaw your berries overnight in the fridge before using. While you can use frozen berries without thawing, you’ll need to give them some extra time in the blender to break down. Add them to a blender or food processor and pulse a few times to break up. I like my jam to be fairly chunky, so I leave lots of whole berry pieces in. 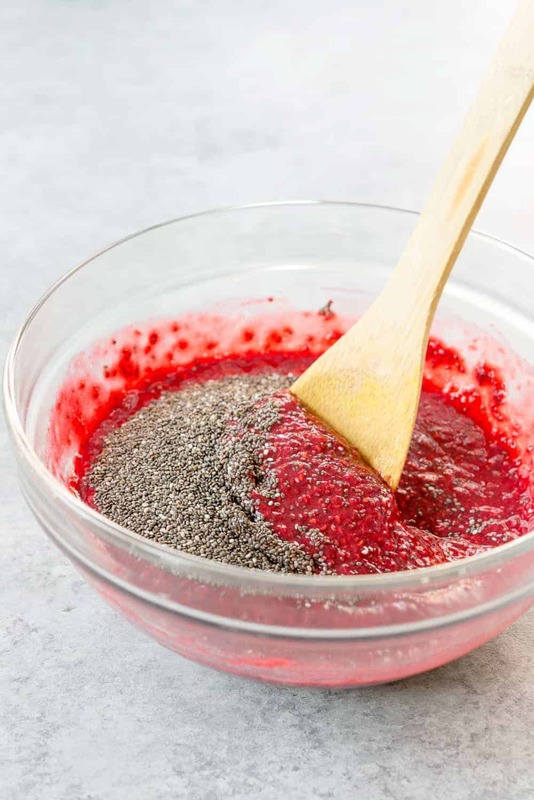 If you want a smoother chia jam, then pulse it more to break up the berries. Add to a bowl along with the orange juice, chia seeds, vanilla and stir to combine. I find that this jam is perfectly sweet with just the orange juice, but feel free to add in maple syrup if you prefer a sweeter jam. Place in the fridge for 15 minutes to just set, then stir and place back in the fridge for 2-3 hours, or until gelled. That’s it! Enjoy on everything. I use frozen raspberries here because I love the color (and raspberries contain an additional 8g of fiber per cup) but any fruit will do. This jam is also delicious with frozen blueberries, cherries, peaches and mango. 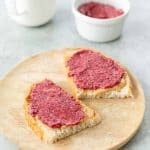 If you haven’t made chia jam before, you are going to be blown away with how easy, simple and delicious it is to put together. 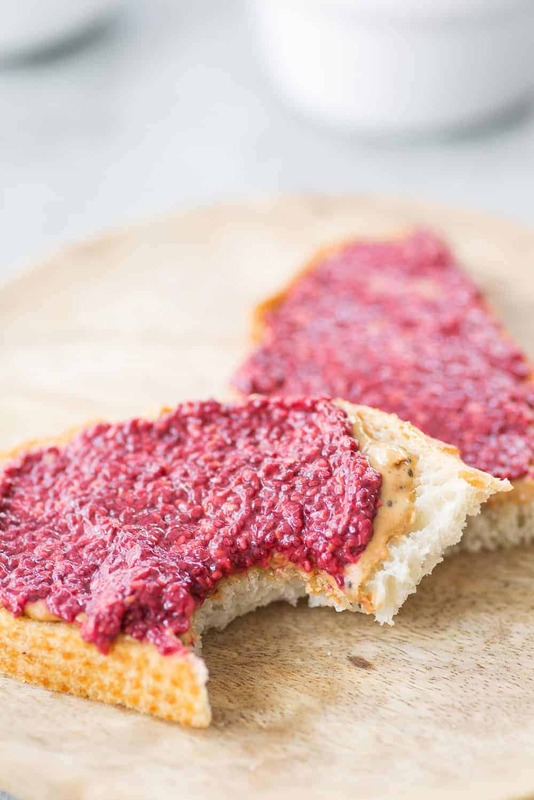 Raspberry Chia Jam made with frozen berries! 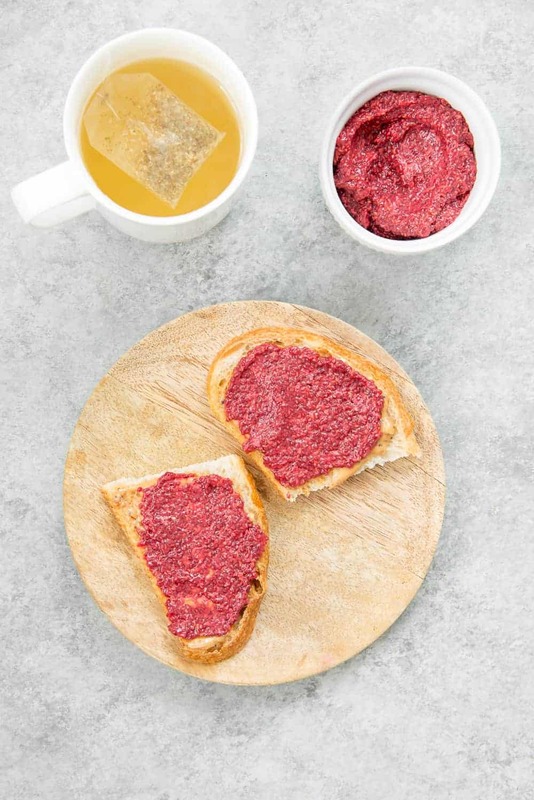 This no-sugar jam takes less than 10 minutes to make and tastes amazing! Only 30 calories, 1g protein and 2.5g fiber in 2 tablespoons! No Sugar Added! Place the thawed berries into the base of a blender and pulse a few times until broken down. 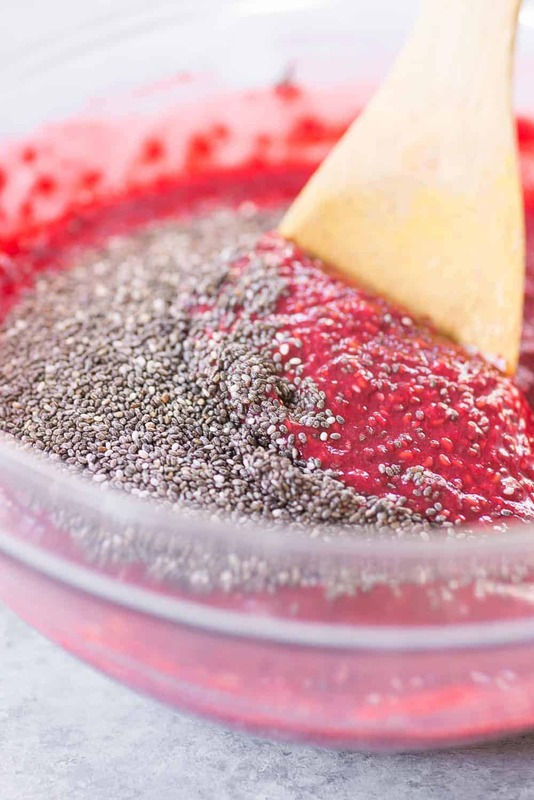 Add the berries into a large bowl and add the orange juice, chia seeds and vanilla, then mix together until well combined. If you prefer a sweeter jam, then add in maple syrup. Place in the fridge for 15 minutes, then remove and stir again. Cover and place back in the fridge until gelled, about 2-3 hours. 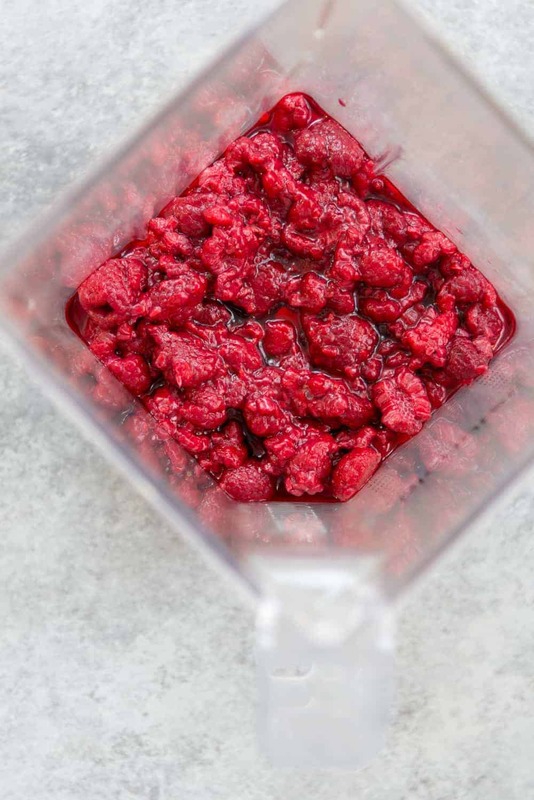 If you want a more smooth jam, then place back in the blender once gelled and blend again.